Empty seats at the Met?! With world class stars and a treasured opera, how can this be the case? As part of the ongoing bid to keep opera accessible and popular, General Manager Peter Gelb has employed a Broadway director and choreographer, a move he recently told the New York Times has been employed over the decades at the Met. Des McAnuff (Jersey Boys) and Kelly Devine (Rock of Ages) have joined the likes of Bartlett Sher (South Pacific/L’Elisir d’Amore) and Jack O’Brien (Hairspray/Il Trittico) in staging an opera at the Met. It must be a tremendous honour to be invited, one that us difficult to refuse even when the task exceeds the capabilities. Melbourne was blessed with an extraordinary production of Faust back in the 1990s when tyrannical English director Ian Judge came out to direct it for the Victorian State Opera. The production lives on in the minds of all those lucky enough to thrill to it stunning visuals, expert storytelling and magnificent singing. Gorgeous Australian soprano Deborah Riedel and mellifluent Russian bass Barseg Tunyaman (sadly, both now deceased) along with memorable tenor Patrick Powers were superb in the leads, and the space of the State Theatre has rarely been used more creatively and strikingly. Imagine, then, the disappointment at the sight of the quasi-updated, ill-fitting staging here that belies the significant resources of the Met. A drab, unimaginative design by Robert Brill sees a couple of endless white spiral staircases flanking a nondescript, industrial-looking space. This stark, severe approach is completely at odds with Gounod’s lush, romantic score, and becomes more disappointing as the night progresses. Costumes, by Paul Tazewell, are somewhat more attractive, although the overall effect being attempted is far from clear. Faust has wonderful ensemble music but McAnuff has no idea what to do with the large Met Opera chorus. 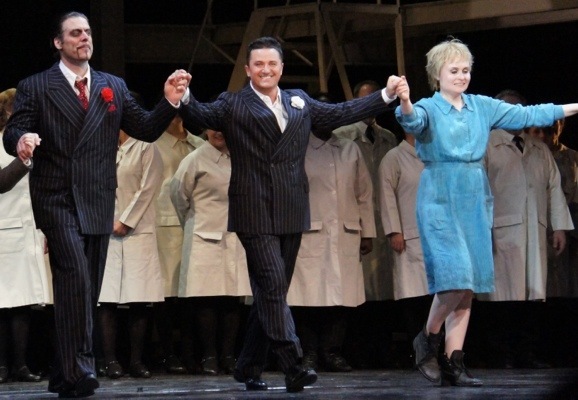 In act one, they appear to have just been asked to find their own spot and stand, with no sense of form or function imposed on them based on the costumes they are wearing or the music they are singing. 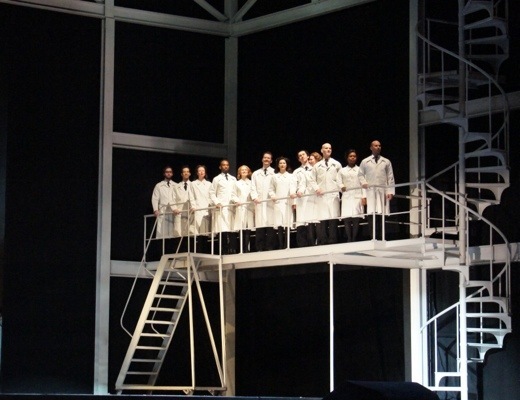 As soldiers and women in act four they are similarly crowded roughly on stage, but in the finale as angels they are at least each given a place to stand. The wide spaces of the set draw energy and focus away from the intimate heart of the story. The use of projected faces, particularly Marguerite’s, seems a cheat in terms of getting the emotions across to the audience. This is a live opera, not a movie, so the acting talents of the singers need to be trusted. Despite the severe limitations of the staging, the singers are in tiptop form. Piotr Beczala proves why he is one of the world’s very top tenors at the moment with a thrilling, highly engaging performance. Blessed with an open, expressive face, the charismatic Beczala immerses himself in the role and the music without resorting to any showy gestures. Achieving an intense volume without actually sounding like he is singing loudly, Beczala’s voice easily fills the cavernous Met auditorium, his high notes also in stellar form. The pure tender of emotion of “Salut! demeure chaste et pure” is the very vocal clear highlight of the evening. Marina Poplavskaya successfully projects the innocent purity of Marguerite, her beauty making Faust’s infatuation completely believable. Poplavskaya’s pure soprano voice suits the role perfectly, from the controlled coloratura display of the Jewel Song to the more tender and vulnerable moments as Marguerite’s strength and character are gradually broken down. 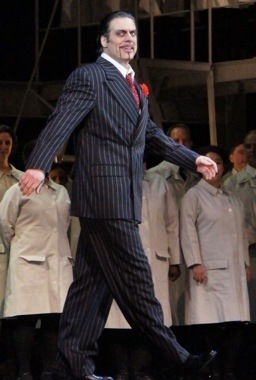 John Relyea is a tall and powerful presence, with plenty of devilish twinkle in his eye as the fiendish Mephistopheles. Relyea has the requisite depth and power of voice, although his bass-baritone is perhaps a little pure to be sufficiently menacing for the role. This is surely a role Relyea will grow further into over time. 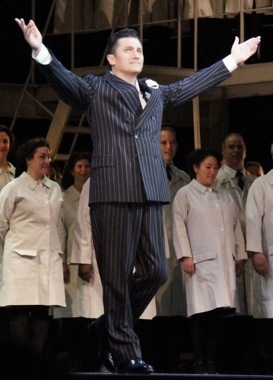 Alexey Markov is a very fine Valentin, with “Avant de quitter ses lieux” another definite vocal standout of the night. Julie Boulianne displays a strong, very pleasant tone as Siebel. Catherine Cook provides gentle support as Marthe. As with the concurrent production of Otello, Maestro Alain Altinoglu conducts a wonderfully rich performance from the Met Orchestra. It now becomes clear why, despite featuring megastar Jonas Kaufmann, the Met has no move towards releasing the Met Live in HD version of Faust from last year. Pack the sets up and return them to the ENO and let us never have to see them again. 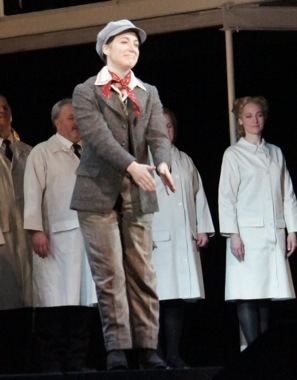 This performance of Faust on 2 April 2013 was the second last in the current season. I thought it stunk last year and I thought I stunk this year. Plenty of empty seats in the Orchestra. The cast was fine.